The world needs more trees. Yes during the times of increasing pollution and global warming, the globe needs more and more trees to be planted. Not only the normal trees but also solar trees. 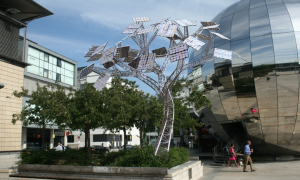 You heard it right – A Solar Tree! Scientists at the CSIR laboratory in West Bengal have planted a solar tree that has the capability to light up to five houses. The tree requires ~4 square feet of area and produces about 3 KW of energy with the help of solar panels and batteries. One can use as many number of solar panels as will be required based upon power consumption. “Initiatives like this will promote usage of green and clean energy and will help the nation combat the threat of pollution” – said Union science and technology Minister Dr Harshvardhan. A solar tree is basically solar panels arranged on a pole, in a manner that they harness maximum solar energy. It is a collection of solar panels put together angularly to absorb the maximum amount of sunlight. I think it could be a good step towards processing more solar energy in a sun rich and energy deficient country like India. It could be easily installed in open common areas of condominiums, parks or even national highways. A lot of innovative ideas around solar are evolving these days. We at Greenworldinvestor have already written about Solar boats and Solar karts in India. The awareness is definitely rising and I am sure all these means will go a long way in improving the pollution problems and energy crisis problems in India. These trees have an aesthetically pleasing design and also have the capacity to supply power to five households. A lot of buildings in India like Suzlon office at Pune, Rajiv Gandhi International Airport (RGIA) in Hyderabad, India’s Environment Ministry, New Delhi etc too boast about solar power extensively. The times have come when solar energy is becoming more and more mainstream. Today Solar energy has been extensively used not only as the main technology in solar farms, solar parks or rooftops; but also in solar products like inverters, solar lights, solar toys, solar watches, solar rickshaws, boats etc. The main advantage of solar power is that it is not only free but it is abundant, as opposed to fossil fuel. I think Solar tree is an innovative idea and should be planted hand in hand with natural trees to increase not only the place value, but also the green quotient of a location. Hi Mohit, noted! will let u know. I am doing master planning for a rural township. Objective is to make it a model rural township. Would you like to guide me where to get the solar trees from? Any Indian Suppliers or technology providers? All please let me know if you need solar tree we are the mnre licensed solar tree manufacturer,please share your email and conatct details will provide all the details. I am looking for a manufacturer of customised Solar Tree. The manufacturer has to make a tree as per the design provided to him. Please send me Solar Tree prices,ratings and other details.